You're at ELMDON HEATH C.C. HALL page. M42 J5 is nearby. Dancers should find this venue very easy to reach by car. What Hall looks like HERE. Hall is NAMED on map HERE. Where? Satellite gMap HERE. Hall is open early to shelter travellers - A welcoming hot drink & biscuits at 1:30pm. NB Bus stop icon at a recess in front of the Hall marks hourly 966 inbound stop from B'HAM INTERNATIONAL RAIL STATION. B'ham Sunday Busses next : then Rail Stations (each has a dedicated page). By each bus route or suggested bus time: is now a CHECK link. Please do just that. Sunday timetables do get changed. 37 Bus from B'ham centre. Moor St MS16 stop Moor St Rail / 3min walk from New St Rail ! Every 10 min! 35 min ride via Acocks Green to bus stop ​opp Lode Heath School, 5 min walk to venue ! RETURN 966 is HOURLY towards International Station : LEAVE DANCE VERY PROMPTLY at END.Timetabled 17:24. Advise wait from 17:21 - BUS 966 to NEC stops ﻿﻿over the road from the Hall﻿﻿ - NB. This NEXT 966 return bus is timetabled at 18:33. You may find PLUSBUS provides a cheaper bus ride AS you book your rail ticket. BUT your set-off rail stat'n must be outside B'ham/Solihull: away from icon area HERE. BEWARE that sometimes Plusbus's quoted times are NOT always fully updated. Depending on such outdated times can be dangerous. Check WM timetables too! Leave a 5 to 8 min walk to Hall. Bus times from station/route and walking route are on the carry-maps. Full details at our page on Solihull Station - HERE : Rail - Solihull Station. In 2016 the direct S1 Sunday bus was entirely removed. Solihull Station stop for 966 Sunday direct was taken out too. But best RETURN to near Solihull Stn : IS hourly 966. Leave dance PROMPTLY at END. Should these 2 rail stations NOT be convenient, check stations on the bus routes above. CONGRATULATIONS, MANDY - another ace pic - OUR LAST DYNAMIC "ONLY LIVELY CONTRAS" DANCE OF 2015 Mandy's Copyright.. Nov 29th 2015. It's a regret that relative convenience of public transport to the Chaplaincy had been used to limited advantage. Students attending B'ham Uni nearby: & those in Cath Soc were not even trying-out Contras at the Chaplaincy. Young and enthusiastic bands & callers are greatly appreciated by our older, as well as by our student dancers. A great line-up is promised - wherever we meet to dance Brummie Contras. 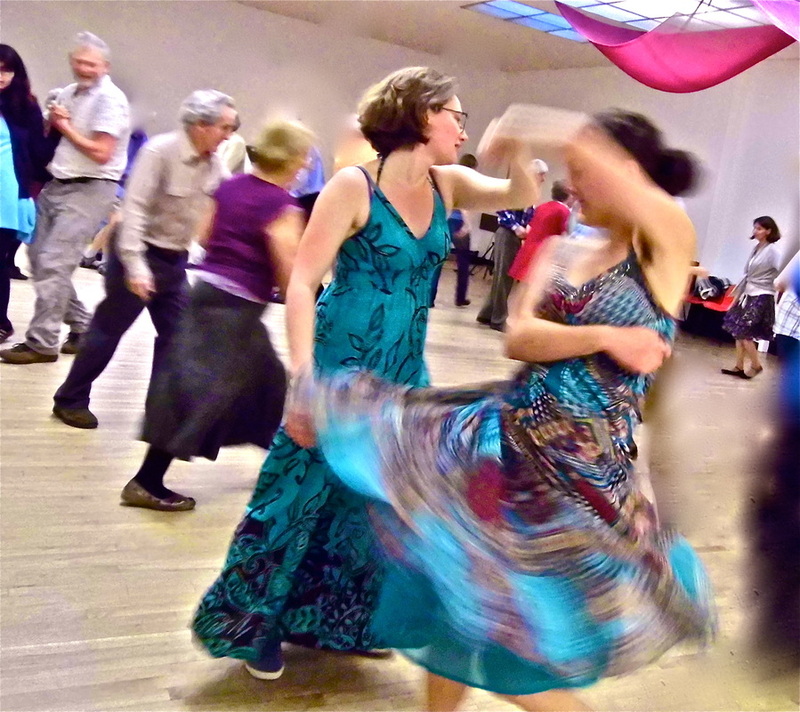 DANCES THERE THROUGH 2016 HAVE BEEN MUCH ENJOYED - BUT IT'S MORE FUN IF YOU COME REGULARLY. Our bands are BRILLIANT - many musicians need to drive a long way. Most musicians are exceptionally generous with time & travel: giving us superb music. Much higher costs loomed at our previous Chaplaincy Hall. David: a new part-time Warden expected 30% more for 2016. This forced a permanent venue transfer. He had also removed the previously agreed side-door facility to unload equipment. Bands kept waiting with their gear at the front, had to lug it all a needlessly long way. increase in numbers - which we need for the Contras to continue. NOW - key access - proper stage - ceiling fans - windows all open - less silly hassels. But bands & callers still need to receive a more fair remuneration, which they deserve ! Most dancers travel by car. Motorways usually cause less stress to car & driver. Elmdon Heath Hall is conveniently CLOSE TO M42 J5. In quiet traffic, 4 mins away. It's labelled position on open Satellite Map HERE. Route from J4 of M42 take A41 - just at first, it's dual carriageway - in just over half a mile are two close sets of traffic lights. At the first lights continue ahead and immediately take the right lane to turn right at the second set of lights into Yew Tree Lane. Continue on a curve to the left, to remain on Yew Tree Lane at a fork. Cross speed humps and pass minor junctions until your road ahead becomes Cornyx Lane. (Damson Lane goes off to your right.) You are passing the Greville Arms on the right. Look left. The hall sign reads "Elmdon Heath Community Centre ". Turn left into Glebe Road: immediately left into the service road. To right of the Hall, take tarmac driveway, & park behind the hall; else further around on its far side. Download ﻿HERE﻿, to print route instructions & a Map. Very easy motorway access! AND Elmdon Heath Hall does "tick more boxes". Plague echoes are present : reduced by side curtains; care, skill & time with sound set-up. For Bands there's a useful trolley to transport equipment from outside onto the STAGE. YEA - there's a PROPER STAGE FOR BAND AND CALLER here ! Access by supplied key SHOULD be preventing repeats of musicians, caller & Jackie needing to hang about outside at the start instead of being able to enter to prepare for dancers. Dancers won't again be insulted by arriving to dance - to find the entrance & side door locked: by a warden having entirely left the premises and given those inside no warning. Windows at Elmdon Heath all open satisfactorily. Ceiling fans cool dancers. (There's one on stage too! ), so we hope for cool summer dances. or leave around a dangerous urn containing boiling water. On our many Dance fliers - adverts for our Dances did much to "sell" the Chaplaincy Hall & its good points. BUT ! No stage. No curtaining to improve acoustics. No opportunity to open windows or through doors, to ventilate. No ceiling fans. Bands kept waiting, then expected to lug equipment through 3 entrance doors and 2 halls, to set up ! Facilities at the Chaplaincy Hall had deteriorated, even since a personal offer to buy sound absorbing foam. In Cornyx Lane, Solihull, it's usually less than a 5min easy drive from M42 J5. A venue move deeply disappointed. This though appeared the best prospect for the future of "Brummie Contras". The Hall is directly indicated on the map ABOVE. PARKING is plentiful - behind the Hall - properly surfaced and safely enclosed. then drive to the right of the hall to park behind the hall itself. The move from the venue previously pictured in our title is likely to be permanent. The MAP ABOVE HERE POINTS OUT ELMDON HEATH HALL off CORNYX LANE. SOME of MANY PROBLEMS ASSOCIATED WITH TRYING TO CONTINUE AT THE CHAPLAINCY ARE OUTLINED ABOVE. to allow the gradual build-up regular dancers - have - like the callers - accepted fees based on our takings. These remunerations have often inadequately reflected their travel and other costs. Band fees have been personally subsidised, when remuneration from takings has seemed particularly unjust..